LD Lines sail between the UK and France as well as France and Spain. Use the search facility below to find the best fares on LD Lines ferries. The LD Lines Ferry Fleet utilizes the latest technology ensuring the highest standards of safety and comfort. Their excellent leisure facilities are tastefully decorated and provide first class service. Travellers can just sit back and enjoy the cruise. Portsmouth and Le Havre are major ports located near road networks expanding throughout England and France making them excellent choices for holiday plans. 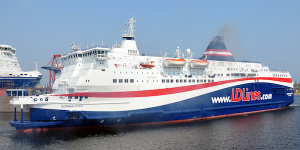 LD Ferries’ “Norman Spirit” has overnight departures which arrive at 0800 in Le Havre. The afternoon return provides a timely return whenever the holiday ends. The Norman Spirit is a modern super-ferry, fitted with stabilizers to optimise comfort during the crossing. Its capacity of 1,850 passengers along with 250 cars and 75 Lorries. On board this LD Ferry guests have ample comfortable seating, shops, food and drink in a friendly atmosphere. The Bistro du Norman covers all food tastes in a self-serve restaurant with great value for the money. Blue Moutain Café Express Coffee Lounge provides coffee, juice, cold beer, and other drinks in a relaxed setting. The Cotton Club Lounge offers the refined comfort of leather sofas and armchairs for guests to enjoy while reading a book; access is for Club Class and Sleeper Seat passengers on the 5:00 pm crossing. A night’s sleep may be had in comfortable cabins or luxurious Sleeper Seats. Extensive outside decks afford enjoyment of the sea, birds, and other wildlife, and a children’s play area along with a games arcade provides entertainment for all ages. Comfortable cabins fit all budgets and requirements. Eighty cabins with fresh bedding, sheets, blankets, and air conditioning are available onboard. Single and four-berth window cabins are outside cabins. Inside two- and four-berth cabins give passengers easy access to toilets and showers. En suite cabins for disabled individuals may be booked by phone; they require presentation of a disabled card when boarding. Standard seating is comfortable and preferred by the budget conscious traveller. Two seats constitute each row ensuring passengers access to the aisle so they needn’t disturb their neighbours. The V spaced seats velvet and Tweed Lounges have a refined atmosphere. Passengers utilise larger, generously spaced for a comfortable opportunity to sleep. Selected alcohols, perfumes, toys, books, chocolate and cameras are available in onboard shops. Special areas are set aside for young children. Video games and cartoons keep them entertain during the crossing. All the ferries belonging to LD Lines have comparable facilities onboard to provide for passengers’ comfort and enjoyment. LD Lines sister company, Transmanche Ferries, operates twice daily return trips from Newhaven to Dieppe throughout the year. Dieppe is situated in Upper Normandy, a lovely area of France for a holiday. The port also has connections with major roads to Paris and Northern France. Travellers are transported on the Côte d’Albâtre. Daily departures leave Newhaven at 0930 and 2230 on the 4 hour crossing, and return from Dieppe at 0500 and 1800 local times. Check in is requested 45 minutes before departure. LD Lines “Norman Asturias” links Nantes/Saint Nazaire to Gijón which takes hours of driving off the traveller’s holiday. Three crossings a week leave from each port. On Monday and Wednesday the Norman Asturias departs Nantes/Saint Nazaire at 2100 and arrives in Gijón 15 hours later; departure on Friday is at 2359. Gijón to Nantes/ Saint Nazaire leaves on Tuesday and Thursday at 2100; on Sunday the Norman Asturias departs at 1600. The Norman Voyager is LD Lines’ ship traversing the Marseille to Tunis route. This ferry has a capacity of 800 people and will provide a trip between Marseille and Tunis every 15 days throughout the year beginning in 2012.